You can get an annual tastecard for just £4.10 with the Daily Mail this weekend (it usuallly costs around £30): simply purchase the paper today, next Saturday and Sunday, sign up and enter the codes on the website, and you can get a free annual subscription. 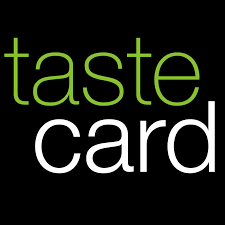 The tastecard gets you around 50% off food or a 2 for 1 deal on food at a number of restaurants (this usually excludes Fridays and Saturdays). It’s usually on offer for around £30. You’ll need to act fast though, as you need to buy all three editions of the paper to be eligible for this deal. The Daily Mail is included in the Waitrose free newspaper offer, so if you’re spending £10 on groceries, you’ll be able to get the paper for free. 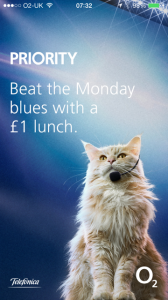 If you’ve got a mobile from O2 (or have one of their SIM cards to register the O2 Priority app), you can get a £1 lunch today (and every Monday) thanks to their Priority scheme (available as an app for Android and iOS, and as a web app for Blackberry and Windows Phone). The lunches include a one-topping four slice pizza at Dominos, or a sandwich, crisps and drink at Upper Crust, Caffe Ritazza or Pumpkin (all stores found at your local railway station). The offer runs from 11am to 3pm every Monday, and you’ll need to use the app. 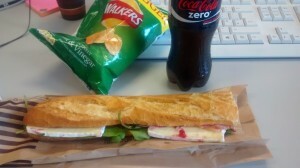 There’ll probably be a few queues too, so I’d avoid the main lunch hour if I were you. Full terms and conditions for Caffe Ritazza, Dominos, Upper Crust and Pumpkin are available on the O2 rewards site. Edit: There’s now an offer for a free hot drink at Caffe Nero every Friday. 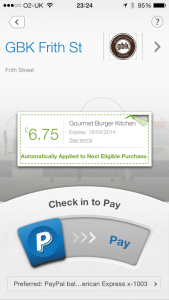 PayPal is currently running a promotion with Gourmet Burger Kitchen to give away 13,000 burgers to users (max 1 per person) who check in and pay using the PayPal app. The app is pretty simple to use, is available for all platforms (including WP7), and uses your existing login details. I haven’t redeemed this yet, but based on the terms and conditions, you need to accept the offer using the app, check-in with the app when you’re in the restaurant, then tell the server that you’re paying with PayPal. If you spend £6.75 or more (the price of their cheapest burger), you’ll get £6.75 off. It appears that you can just open any GBK restaurant within the app now and click on the voucher to add it to your offers – would advise doing that to make sure you don’t miss out on being one of the first 13,000. It’ll then be “automatically applied to next eligible purchase”. You’ll then have until 17th April to redeem your offer. 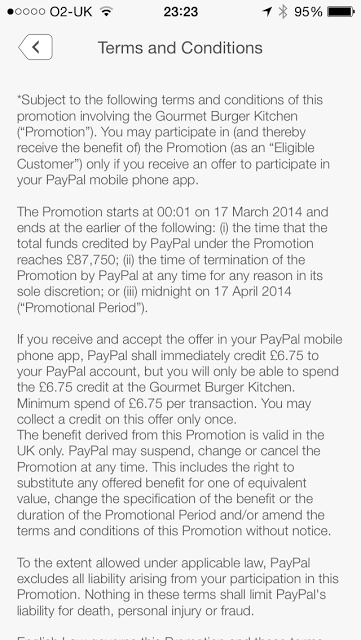 Also, you should be able to use this offer with tastecard or other vouchers, so long as you spend over £6.75. That could potentially mean two free burgers. Terms and conditions are only available in the app, but I’ve posted them here.